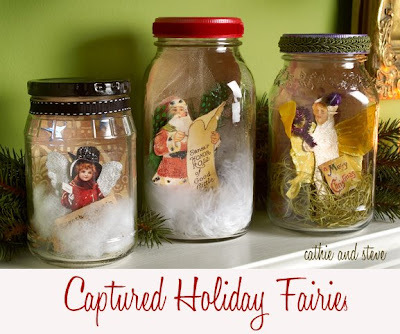 Capture the spirit of the holidays by creating a captured fairy vignette in a recycled jar. We designed this project for Plaid. 2159 - FolkArt ® Gems™ - Ruby, 2 oz. 493 - FolkArt ® Metallics - Bright Red, 2 oz. 654 - FolkArt ® Metallics - Amethyst, 2 oz. 661 - FolkArt ® Metallics - Sequin Black, 2 oz. CS11275 - Mod Podge ® Glitter - Hologram Gold, 8 oz. 1. Wash and dry the jars. Spray the lids with metal spray primer and allow to dry. Coat each lid with a different color of FolkArt Metallic paint (black, red, amethyst). Apply additional coats of paint until you are happy with the coverage. 2. Cut a piece of scrapbook paper to fit inside the back of the jar. Place the paper in the jar. 3. Mount your images to a scrap of cardboard using a glue stick for stability. Once dry, cut around the images, leaving a 1/2 tab at the bottom for folding and gluing. 4. Glitter the image, coat the image with a thin layer of Mod Podge Hologram Gold Glitter or FolkArt Gems and allow to dry. For dimensional highlights, add FolkArt dimensional paint in glitter colors to highlight areas of interest. For these designs, we used Mod Podge over the yellow fairy, FolkArt gems over the Santa Claus and FolkArt dimensional paint on the New Years Eve fairy. 5. Add wings by hot gluing feathers, wings, butterflies, cut paper or tulle to the back of the cardboard cutouts. 6. 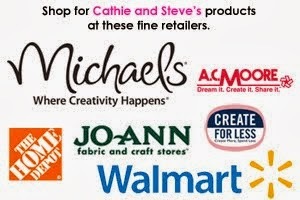 Add additional embellishments like: pipe cleaners, stickers, printed words, rhinestones, etc. 7. Fold the tab on the bottom of the cutout. Add hot glue to the bottom of the tab, carefully place the cutout in the jar and glue to the center bottom of the jar. Use needle nosed plies to help hold the cutout into position. 9. Hot glue a decorative ribbon around the top if the jar.